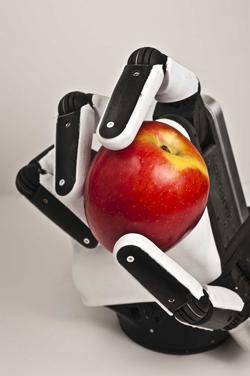 We’ve reported on several robot hands that enhance the human hand and give it extra strength and endurance. Now Sandia National Laboratories has created a low-cost robotic hand that can help soldiers in disarming improvised explosive devices (IEDs). The Sandia Hand mimics human fine motor movements. If a finger pops off, the hand can use its remaining fingers to pick it up and resocket it. The fingers (attached to the hand with magnets) fall off easily because they’re designed to do so, in case the operator smashes the hand against another object. This prevents the hand from breaking. The fingers’ modular design also means operators can mix and match fingers with different shapes and functions or attach other tools, such as flashlights, screwdrivers, or cameras. Operators control the hand with a glove. Developed by a team led by principal investigator Curt Salisbury, the Sandia Hand has a tough outer skin covering a gel-like layer that mimics human flesh. This helps the hand grab and manipulate objects the way a human hand would.